I’ll be the first to admit that when I first heard of 5 Seconds of Summer it was because of my niece Kayla. At the time, she was starting to get the hang of playing guitar and she said, “There’s this cool band called 5 Seconds of Summer, you should check them out.” I said, “Okay, but didn’t they open for One Direction?” She proudly said, “Yes,” and played a few songs. Thomas Dolby (left) and Steve Vai. At the 2018 NAMM Show in January, Roland and BOSS presented Lifetime Achievement Awards to synth-pop and electronic music pioneer Thomas Dolby and guitar virtuoso, artist, and producer Steve Vai. 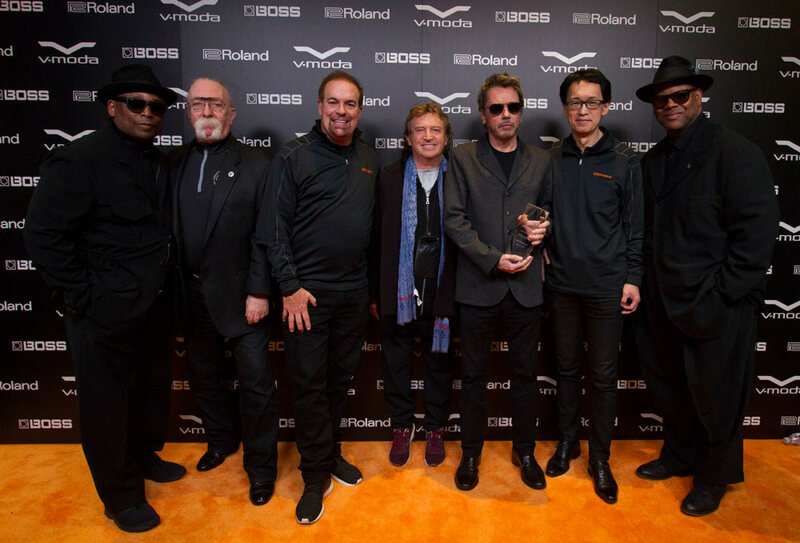 These annual awards recognize innovative music artists for their important contributions to the industry while using Roland and/or BOSS gear throughout their careers. Dolby and Vai join an exclusive group that includes past recipients Jimmy Jam, Terry Lewis, Jeff “Skunk” Baxter, Jean-Michel Jarre, and Andy Summers. Join Roland, Serato, V-MODA, and Guitar Center for a detailed look at the DJ-808 DJ Controller, the trailblazing new instrument that breaks the barriers between DJ’ing, performance, and production. The DJ-808 is the first DJ instrument to combine deep Serato DJ software integration with a built-in Roland TR drum machine—which includes sounds from the 808, 909, 707, and 606—and an onboard sample sequencer. Adding in a four-channel mixer, AIRA Link USB ports, a VT Vocal Transformer, ultra-high-performance platters, layers of performance pad features, and more, the DJ-808 greatly expands the creative possibilities for DJs, producers, and electronic musicians. The Serato x Roland DJ-808 tour will be coming to select Guitar Center locations in the first half of December 2016. At each event, Roland experts will be available to provide hands-on demos and answer any questions you have. Certain locations will also feature special demos and performances by leading artists. Read on to find out when the tour is coming to your local Guitar Center. Capacity is limited at each event, so RSVP today to reserve your spot! Fronted by Chelsea Davis (vocals/drums) and Dan Silver (guitar/synth), MOON descends the spirits of lush soundscapes over gritty beats with insatiable attitude. Embracing genres from shoegaze, desert rock, folk, and soul, they maintain a healthy electronic presence in their sound. Read on to check out a Roland Sessions performance of “I Got a Fever,” the band’s latest single, plus an interview where they talk about how they use their Roland gear. Linda Perry and her band perform at Six01 Studio on #909day. On September 9, 2016 (#909day), over 1000 people joined Roland at Six01 Studio in Burbank, California, for the final showcase of “The Future. Redefined.”, a first-of-its-kind 24-hour streaming music festival. Throughout the festival, leading music artists introduced over 30 brand-new Roland and BOSS products in performances from eight major cities around the world. The final stop in Burbank featured a live, five-hour concert with performances by 28 artists, including Linda Perry, Saint Motel, Echosmith, DJ Pierre, Judith Hill, She Wants Revenge, and many others. Read on to learn more about this great event and the exciting new products launched on #909day.